The Singapore International Film Festival (SGIFF) is the largest and longest-running film event in Singapore for over two decades. The SGIFF is an event of the Singapore Media Festival, hosted by Media Development Authority (Singapore). The 26th edition of SGIFF this year was held over a span of 11 days, from the 26th of November 2015 to the 6th of December 2015. Stepping out from a seemingly ordinary laundry shop and onto the red carpet at Marina Bay Sands are the stars from The Laundryman! Leading actress Sonia Sui Tang from Taiwan, Singaporean actress Yeo Yann Yann, as well as the film’s Taiwanese director, Lee Chung met with their fans and graced the screening of their film. Lee Chung’s previous short film, Mochi, won him titles of "Best Short Film" and "Best Director" at the Golden Harvest Short Film Awards in Taiwan. Straddling across a surprising blend of genres between horror and comedy, The Laundryman is the novelist-turned-filmmaker’s first feature film. The film was shown as part of the on-going 26th Singapore International Film Festival (SGIFF). With Fad at Marina Bay Sands Sky Park's virgin red carpet event! The next event that we got to cover was: "The Man Who Knew Infinity"
Based on a true story and aided by stunning performances by British actors, Dev Patel and Jeremy Irons, American director Matthew Brown’s directorial debut brings to life the brilliance of a man whose magical mind and pivotal theories brought him from obscurity to greatness redefined. The arrival of Dev Patel, the leading actor for "The Man Who Knew Infinity" as well as for the 2009 Oscar-Awards winning film "Slumdog Millionaire"
Director Matthew Brown was born and raised in Boston, Massachusetts. A graduate from Trinity College, he also adapted a biopic on James Bond creator, Ian Fleming, and wrote "London Town". The latter is being produced into a film starring Jonathan Rhys Meyers. Brown’s most recent work was a drama for AMC network. The cast of "The Man Who Knew Infinity"
Founded in 1987, the Singapore International Film Festival has become an iconic event in the Singapore arts calendar that is widely attended by international film critics, and recognised worldwide for its focus on Asian filmmakers and the promotion of Southeast Asian films. The SGIFF is committed to nurturing and championing local and regional talents in the art of filmmaking. The festival serves as a catalyst in igniting public interest in the arts, and encouraging artistic dialogue and cultural exchanges. This year's 26th edition of SGIFF drew over 12,000 festival-goers from Singapore and across the region. Committed to celebrating independent cinema and telling Asia’s story in film, the longest running international film platform in Southeast Asia showcased a total of 146 feature and short films from 51 countries this year. Not only were its various post-screening talks and masterclasses with acclaimed filmmakers well-attended by festival-goers, the SGIFF also saw a total of 14 sold out screenings – of which five were local productions (Bugis Street, In The Room, Mee Pok Man, The Return, The Songs We Sang). The SGIFF is organised by the Singapore International Film Festival Ltd, a non-profit organisation and holds the Institution of a Public Character (IPC) status. Note: Special thanks to my dearest friend Fad and the 26th SGIFF committee for extending this year's SGIFF invite to me! Last Monday, Dazzling Café held a launch party at their flagship store at Capitol Piazza Mall, in celebration of their first-ever collaboration with Warner Bros’ iconic character, TWEETY! The signature icon, Tweety made special appearance — because duh, he had to right?! — and so did popular TV drama series actor and celebrity guest, Shane Pow, who also graced the event with his presence! Shane had a group of fans who were waiting outside the café, hoping to catch a glance of him! They were really cute by getting all hyped when he finally made his appearance and also when they cheered him on as he had a friendly "Lava Toast-making" match with another invited guest! So sweet!! Tweety has always been known to be fun and spirited and echoes Dazzling Café’s young, trendy and sweet disposition. I believe everyone at Dazzling Café will have a memorable and fun experience, as they celebrate the fun personality traits of Tweety, it will remind them of themselves! Tweety sparkles as one of the most popular Looney Tunes characters, with a strong appeal to girls of all ages, and has become a globe-trotting, trend-setting fashion icon that is an embodiment of sweetness and a fun loving lifestyle. 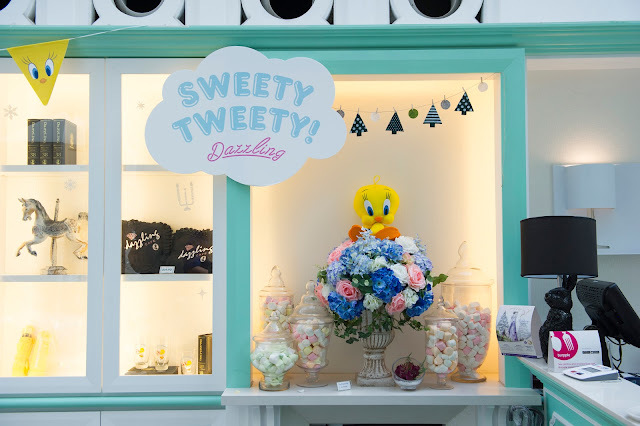 We are excited and very proud to be working with stylish Dazzling Café to bring the Tweety experience to Singapore! 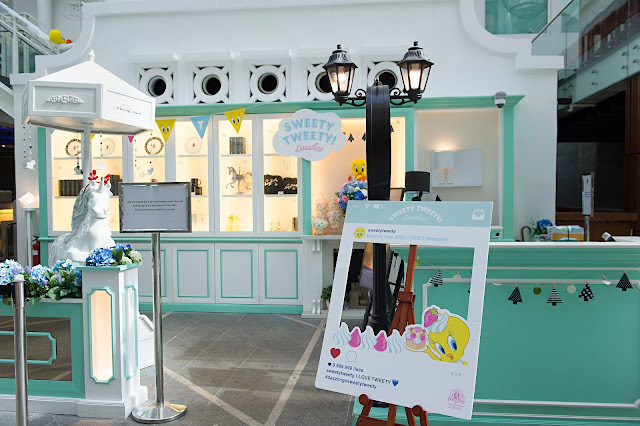 The event unveiled the new special edition ‘Sweety Tweety’ menu, which would be available from now till Valentine's Day next year, 14 February 2016. Dessert lovers can expect all-things Tweety with the specially crafted menu, including Dazzling’s menu favourites — lava toasts, profiteroles, mac and cheese, biscotti, iced teas and au laits! A fruity and refreshing glass of iced strawberry lychee bespoke tea, which settles with a red finish from the strawberry. However the lychee overpowers in taste, leaving a refreshingly sweet tang in your mouth! Fresh leaves and strawberry bits are sprinkled on top to add to the refreshing sweetness of the drink. The Tweety Mac & Cheese is a dish that all cheese lovers will love! It consists of 4 different types of cheese — Elementa cheese, Gruyere, Mozzarella and crispy Parmesan cheese — to create an indulging treat that one can have at any time of the day! Yay! One of the café’s best-seller and also Shane Pow's favourite, the signature lava toast with a new twist! It is now accompanied by mango puree whip cream and vanilla ice cream, it blends well with the lava chocolate that oozes out of the toast as you slice it open. An all-time favourite, it is presented just like Tweety, with a layer of sable a choux on the top! This creates a slightly crunchy crust over the profiteroles and balances the textures between the creamy crème patisserie and soft choux pastry. Topped off with snow powder, pistachio and almond flakes, this treat is a must-have for sweet lovers. What I really love about the Tweety Mac & Cheese is the addition of mushrooms which added more flavour and texture to the dish. It also helped that despite the numerous quantity of cheese used, it was surprisingly not overwhelming in terms of its taste. The Tweety Mac & Cheese was towards the creamier side (kind of like a carbonara) but a much lighter version. This dish is definitely suitable for those who hate feeling "gelat" after having had something too creamy/cheesy! The signature dish, Tweety Lava Chocolate Crispy Toast definitely lived up to its name of 'crispy toast'. I loved hearing the crunch sound as I sliced my butter knife into the toast. I wished that there were a bit more chocolate so that I could really get the oozing feel as they described. Nonetheless, I like the taste of the entire combination. Tweety Lava Chocolate Crispy Toast was sweet with a tad of saltiness from the bread, and the vanilla ice cream added a punch of iciness that makes it great as a cooling treat in our hot Singapore weather! With that said, this drink can be a tad too overwhelming for some as it might come across as being far too sweet and tough to consume. I am always in for a good profiterole! These profiteroles are indeed good, however I would say that there isn't anything unique about it that makes it stand out from all other profiteroles that I have ever had. Nonetheless if you need a profiterole-fix, the Tweety Classic Profiteroles from Dazzling Café would definitely make the cut! Some other features on the Tweety menu which you should definitely try out are the Tweety Mocha Slushie and Tweety Biscotti Caramel Tea Set. Started in 2010, Dazzling Café Pink is its first café serving honey toast in Taipei and enjoys explosive popularity with a huge following in Taiwan. Dazzling Café is now one of Asia’s fast-expanding trendy and hip café chain with presence in Taiwan, Shanghai, Hong Kong and Singapore, and is renowned for its long queue of people awaiting to grab a bite of their signature toast!! The café embodies the mix of fashion, culinary and drinks in its business and marketing strategy. Singapore first flagship store "Dazzling Café Mint" opened in June 2015 in the heart of the city at Capitol Piazza! It is now a popular local favourite for its honey toast and desserts, the Singapore café echoes the success of its Asian partners with the long queues during peak hours! To enhance the celebration, Dazzling Café will also develop and offer a range of ‘DAZZLING CAFÉ X SWEETY TWEETY’ collectible merchandise in limited quantities. Designed with its trendy and fashion-forward female patrons in mind, the collectibles will include drinking glasses and umbrellas. Here is a piece of good news for all cafe hoppers: Dazzling Café will be opening their 2nd Singapore outlet in the first quarter of 2016! So do keep a look-out for its opening day! 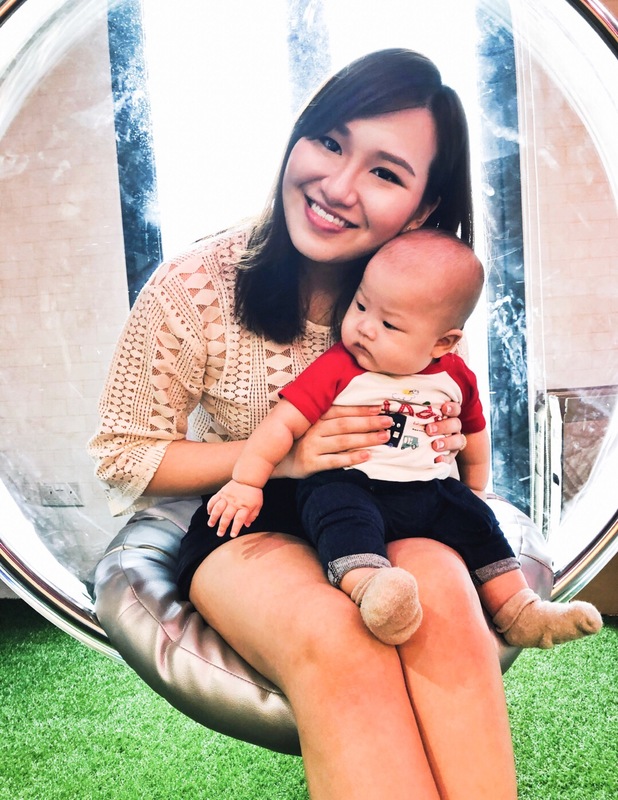 Note: This post was kindly sponsored by Dazzling Café Singapore and Access Communications. Happy Plugs: Making Music Fashion-Forward! Happy Plugs is a Swedish brand born in 2011 that creates and manufactures stylish mobile accessories, born with the ambition of transforming essential tech accessories into fashion must-haves. We believe that mobile accessories not only should fit your mobile device, but also fit your style. We like to keep it elegant and classic, but yet fun and affordable. Since the reach of Happy Plugs' global success of transforming headphones and mobile accessories into fashion accessories, here comes the launch of "Happy Plugs Sound Piece" as the time has come to bring interior design to consumer electronics. The speakers elegant features and sleek design makes it a classic interior design piece, but with a twist. The speakers are the first of its kind to offer individual customization – the grills are available in multiple designs and can easily be replaced by hand with another color or style. The Happy Plugs Sound Piece concept was born from the challenges of finding electronic sound devices that fits your individual home and furniture perfectly. All of our other products have been created to suit the mood, style and personality of our customers so when we created Sound Piece we wanted the speakers to suit the interior of their home! Colour sets the mood for your room and the colour of your choice is really about what you would like the room to feel like, isn't it? Here is how you switch the grill colour on your Happy Plugs Sound Piece! Step 2: Pull it out and you're done! It is as easy as 'abc'! Multitude of colours and designs to choose from! The Sound Piece is an essential centerpiece in your home, serving both as music center and design item. With the power to be the primary sound source in your living room without taking over with wires or a clumsy design, this speaker will become an elevated “it” feature in your home. The Sound Piece Mini is your perfect on-the-go speaker, an attractive and compact portable speaker ideal for traveling and days of leisure. With the built-in microphone, the Sound Piece Mini services as a conference speaker and speakerphone too! The battery has a lifespan of up to 14.5 hours with the extra feature of an emergency power bank, allowing for smartphone charging at any location or on-the-go! Each speaker arrives with the signature black grill and new exchangeable grills come in the same colors and styles as the existing Happy Plugs design portfolio. The Happy Plugs Sound Piece is retailing at $329, while the Sound Piece Mini is retailing at $139. The products, including the additional grills, can be purchased from Atlas E-Store and selected resellers island-wide! Special thanks to Fad, Happy Plugs and Affluence PR for extending the invite to me! The drinks available at Attap House range from the traditional Coffee or Tea, Honey Lemon Tea, Sour Plum Drink, Iced Lemon Tea or Home-made Barley. Although there is the option available of having your drinks either hot or cold, do note that for certain drinks an additional charge of +30¢ is required when served cold. Do not belittle this small slice of bun and otah that you see. The portion of food (as seen above) was taken so as to showcase the inner fluffiness of the bread and the thick slab of otah given as well as the gracious amount of seafood placed into it — check out the whole prawn used! The actual portion of the bun and otah is actually almost the size of a person's palm! When consumed together with a small slice of butter, one will be hit by waves of savoury spice, sweetness and buttery fragrance. To make this dish, the choice of fish steak used is dory fish. I personally love the assam sauce which had an adequate balance of spice and sourness, however I can't say the same for the fish as it had a distinct fishiness — most likely due to the choice of fish used. Nonetheless a commendable effort for creating a fantastic assam sauce that would go well with white rice and it provided a tangy spicy taste to the otherwise bland brinjal and okra. Thick slices of meat coated in a savoury black sauce? YES PLEASE! The pork chop might come across as being a bit too salty when consumed alone, thus it is best eaten together with a mouthful of the accompanying sambal fried rice! With its satay sauce made from a mixture of both peanuts and cashew nuts, one would be amazed by the tinge of cashew nuts' sweetness and aromatic fragrance! The sauce is less oily and less salty as compared to those that you have in coffee-shops and hawker centres, thus making it a healthier and available option to satisfy your craving for Satay Mee Hoon! THIS IS MY FAVOURITE DISH OF THE LOT. Yes I know that this dish cannot be any more simple, but it is always the simplest things which are the most pronounced. If you have read my Instagram caption for this plate of fried rice, you would know that this dish reminds me of my mom. This is how my mom cooks her fried rice. It tastes savoury and has a little bit of spice from a sprinkle of pepper. The fresh bits of chicken breast meat adds a whole new dimension to the dish because it provides texture and the savoury-sweetness of fresh chicken meat is incomparable to any unhealthy preserved meat sold in supermarkets. If you have never ever had this before... I'M JUDGING YOU. What have you been eating at Tze Char stalls?! Braised Hokkien Mee is a traditional dish that is in most Asian menus, and this one from Attap House originated from an old lady who has been cooking hokkien mee for over 50 years of her life. Watch the video below to learn how you can replicate this dish back at home! Learn from Executive Chef, Mr Marco Ong on "How To Cook Braised Hokkien Mee"
Upon being served this dessert, I could smell the fragrance coming from the use of coconut milk and pandan leaves. This dessert is not overly-sweet and the cubes of taro and purple/yellow sweet potatoes provide great texture and taste to this bowl of traditional Asian dessert. I highly recommend this dessert, and I cannot wait for their kaya and peanut butter jam to be sold in jars! This is the best kaya and peanut butter jam that I have ever had in my life. Forget about how Skippy has always been promoting its peanut butter jam to be the smoothest that you will ever have... you have never had smooth peanut butter until you have tried this one from Attap House! Attap House is a local homegrown eatery started by Mr Edmund Koh and the restaurant begun its operations in July 2015. The local restaurant was created with the hope of bringing back nostalgic memories from the 1970s-1980s. This casual dining area is able to contain 80-seaters with both its indoor and outdoor seating areas. The design of the eatery included aspects that would remind of the kampung days — from wooden tables and rattan chairs as the choice of furnitures used, to straw mats used as their wallpaper, and tungsten-bulbs as the choice of lighting which brings back memories of how those were the only lightbulbs available back in the old days. The restaurant's menu serves a variety of Asian- and Nyonya- inspired food and beverages, all created in the kitchen by Executive Chef Mr Marco Ong. The Executive Chef has had 16 years of international experience under his belt and strives for authenticity with every dish produced from his kitchen. Attap House is suitable for office workers (working in the vicinity) to drop by for a quick and satisfying lunch or to take a tea break. It is also great for families of big and small to gather together for a nice breakfast or scrumptious dinner. For breakfast/tea, individuals can choose from the available options of Homemade Otah Toast or freshly-made Peanut Butter and Nyonya Kaya with either toast or waffle. I LOVE THE PEANUT BUTTER AND NYONYA KAYA JAM AT ATTAP HOUSE! I have never had any jam that tasted as smooth and creamy before! The peanut butter jam at Attap House is made in-house with an added natural sweetness combined with a light fragrance due to the introduction of cashew nuts into the jam. As for the nyonya kaya, it is also made in-house with a stronger punch of caramelised sugar due to the addition of gula melaka. The signature main course(s) at Attap House are their Satay Mee Hoon, Braised Hokkien Noodle, Pork Chop Sambal Fried Rice and my personal favourite Cashew Fried Rice with Fresh Chicken Breast. As an effort to fill more Singaporean tummies with their delish food, Attap House has implemented their own delivery service* which is available from 9am to 11am, and 2pm to 7pm. Call 9052 2669 to make your order! *Do note that delivery is free only if the order is above $30! Note: This post was kindly sponsored by Attap House and The Influencer Network.